The Courtyard Gardens of the Future as a collective landscape with green nature experiences, and where sensuality, tranquillity and immersion are watchwords and a reflection of the residents’ wishes. The combined courtyard garden provides space for new types of communities, among other things through residents’ flower beds, communal spaces and places to gather in the courtyard garden. 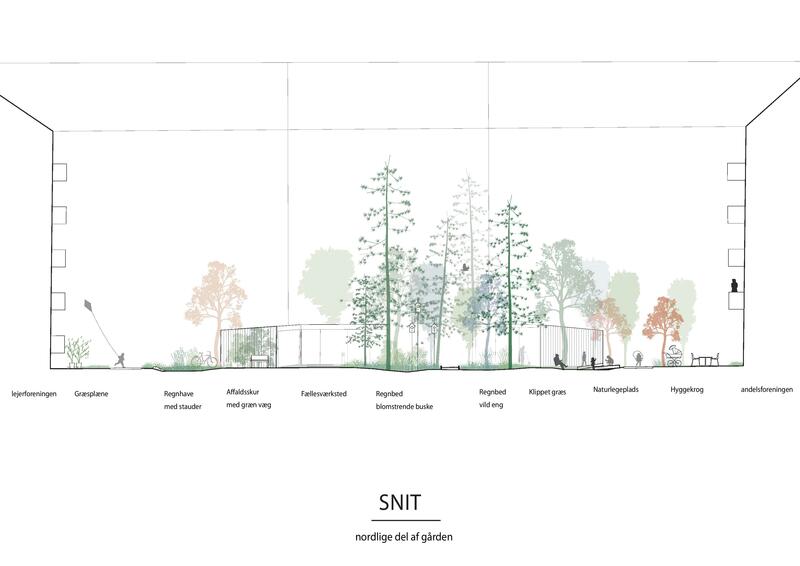 This architectural approach and landscaping have arisen from the idea of participation. New and familiar local rainwater drainage solutions are linked and create a delta, where the path followed by stormwater shapes the landscape and the life-giving and dynamic element in the courtyard. The courtyard can be regarded as one combined rain bed that collects, retains or percolates the water. Købehavns Kommune, Udlændinge- Integrations og Boligministeriet og HOFOR. 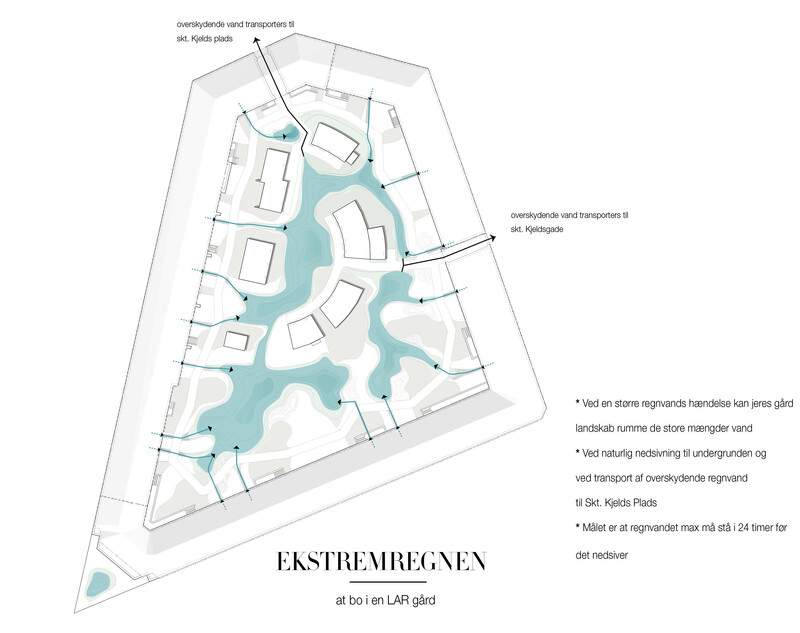 In the City of Copenhagen we put great emphasis on involving the people of Copenhagen in the projects we carry out. This intention has has a strong bearing on the process leading to the final project proposal for the Courtyard Garden of the Future at Skt. Kjelds Plads. We have implemented the project as an innovation process driven by cooperation, in which residents, the advisory team and specialists in the municipality have each contributed their own knowledge. The residents came with their wishes and dreams and needs, the municipality with its requirements, experience and political goals, and the advisers applied their various professional capabilities to convert the various inputs and discussions into the principal project concept: the delta, which is the principal feature of the project proposal for the new courtyard garden. The proposal for the new courtyard garden has been developed through a number of residents’ workshops and practical work on setting up a full-scale trial in the courtyard. The participants have had an impact on and decisively influenced the design of the courtyard garden. The residents have emphasised in particular having a tranquil courtyard with provision for quiet relaxation and a green, sensual and luxuriant courtyard garden. In parallel, the municipality’s interdisciplinary task force and advisory team have held three workshops, with the aim of coming up with joint proposals for the visions and frameworks of the project. There has been a particular focus on the courtyard garden, in addition to managing stormwater, also creating good frameworks for new types of communities to arise. The courtyard at Skt. Kjelds Plads today has the appearance of a very open courtyard space with tall board fences and garage facilities. The courtyard, which overall is on a par with Kultorvet in terms of size, is divided into three smaller spaces, corresponding to ownership. A large garage complex occupies most of the northern part of the courtyard, belonging to the apartment block. The garages divide this part of the courtyard into narrower passages without good options for the residents to spend time. Both the cooperative association and the homeowners’ association have small and narrow free areas where the residents to a minor extent have an opportunity to relax. Apart from the homeowners’ association’s courtyard garden, the present-day courtyard spaces on the whole do not offer many options for the residents to relax and express themselves. Here you can find drawings, diagrams, descriptions of local rainwater drainage solutions, documents from the medical officer of health, analysis tools and documents and presentations from the development and construction process and the regular and subsequent registrations and evaluations. The documents and information and therefore updated continuously, as the project progresses and in the first few years after the courtyard garden is first used. 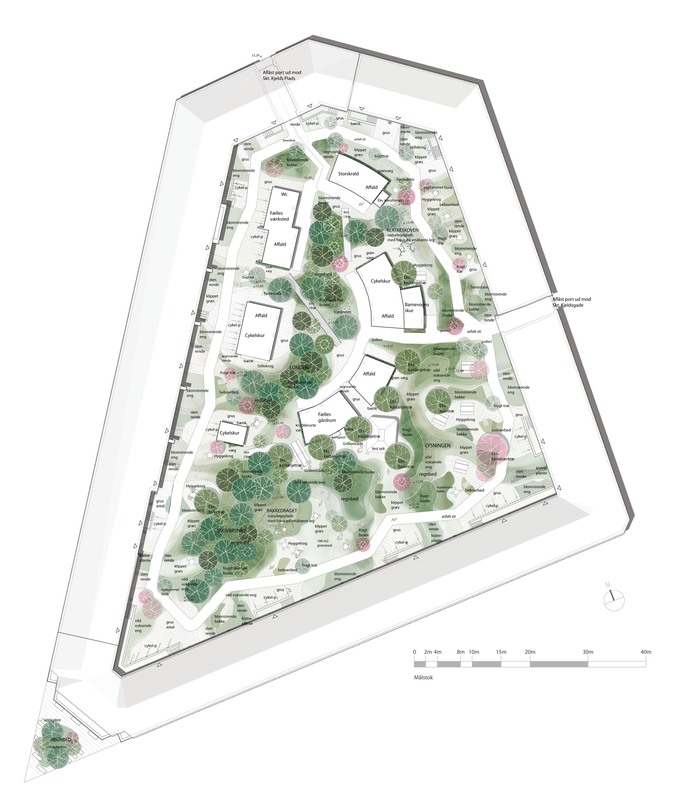 Plan showing the arrangement of the courtyard with path, common facilities and green spaces such as the climbing forest, the range of hills, the grove, the clearing and the woodland edge. One with material (from Rockwool) that can bind the water and in that way could ensure plant-available water over a prolonged period. Documentation from the process: mapping, the residents’ wishes, descriptions from full-scale trials, etc. When the courtyard garden has been constructed, various types of rain beds are described, the coverage and growth of the plants and how well they thrive are recorded, and a photographic record is made at the start of the growing season, in the middle of the growing season, at the end of the growing season, after one year and after three years. An analysis is made of the strengths, weaknesses, challenges and forward-looking recommendations for each bed beforehand, which are updated after each recording. In principle it does not cost more to manage rainwater on the surface than to replace or expand the existing sewer pipes. 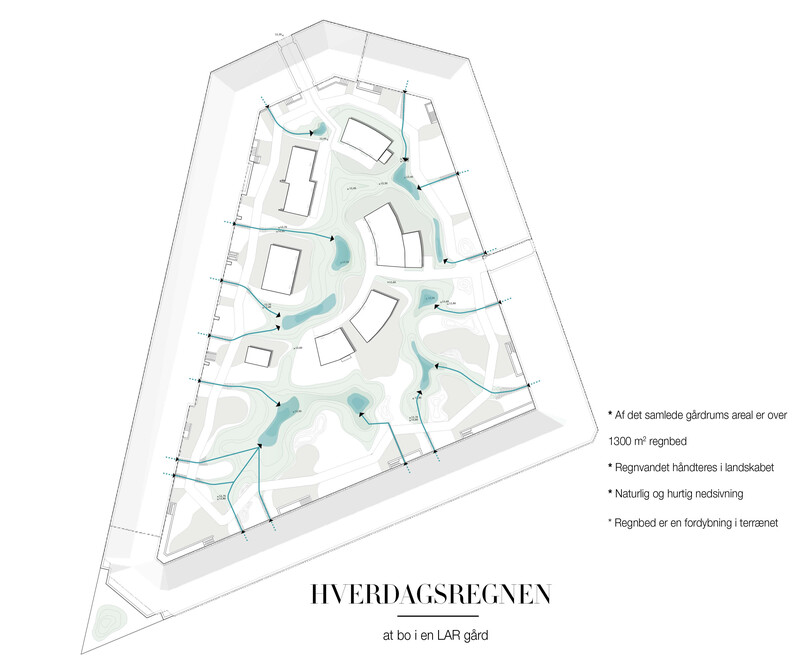 The City of Copenhagen therefore puts great emphasis on the great secondary gain there is in using the rainwater locally to create green and recreational courtyard spaces instead of underground structures. When the Courtyard Garden of the Future at Skt. 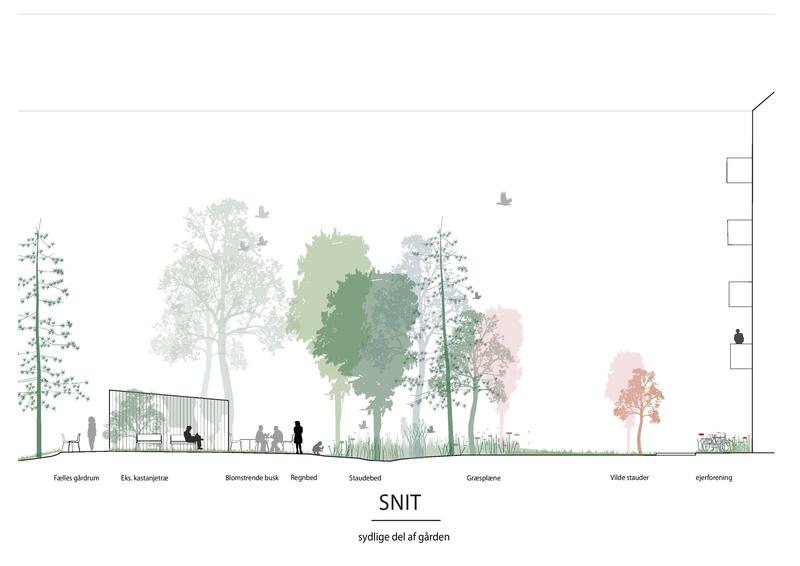 Kjelds Plads has been constructed we will publish the key economic figures and prices for what it costs to establish the individual rainwater management solutions, as well as a number of figures for comparison.